River Valley junior Chase Caldwell (14) defends a 3-point attempt by Ironton Saint Joseph’s Zach Roach (12) during the second half of Wednesday night’s boys basketball contest in Bidwell, Ohio. River Valley sophomore Jordan Lambert, left, blocks a shot attempt by Ironton Saint Joseph’s Zach Roach (12) during the first half of Wednesday night’s boys basketball contest in Bidwell, Ohio. BIDWELL, Ohio — Thoroughly gratifying. 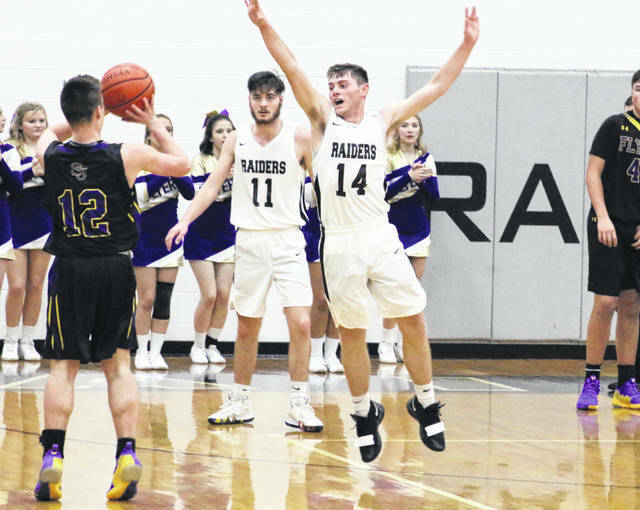 The River Valley boys basketball team led the final 17 minutes of regulation and never trailed beyond the first quarter while snapping a seven-game losing skid on Wednesday night with a 55-46 victory over visiting Ironton Saint Joseph in a non-conference matchup in Gallia County. The host Raiders (3-16) built a quick a 7-0 lead just over two minutes into regulation, but the Flyers (13-6) countered with a 12-1 surge that ultimately provided the Purple and Gold their largest lead of the night at 12-8 with 3:10 remaining. The Silver and Black, however, countered with a 9-2 charge the rest of the canto and secured a 17-14 cushion through eight minutes of play. ISJHS rallied to knot things up at 19- and 21-all with just over two minutes left in the half, but Brandon Call gave the hosts a permanent lead while sparking a 6-0 run with a basket at the 1:16 mark. Saint Joe, however, managed a putback basket just before the halftime buzzer sounded as Matt Sheridan hauled in an airball under the basket and released the shot all in one motion, allowing the guests to trim their deficit down to 27-23 at the break. 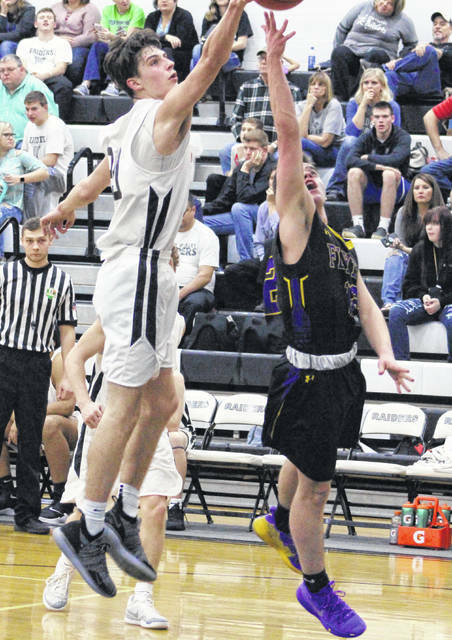 River Valley hit three of its first five shot attempts of the third stanza and led by as many as 10 points before securing a 40-33 cushion entering the finale. The Flyers made one last charge, a 10-4 run that closed the gap down 44-43 following a J.C. Damron basket with 4:31 left in regulation. 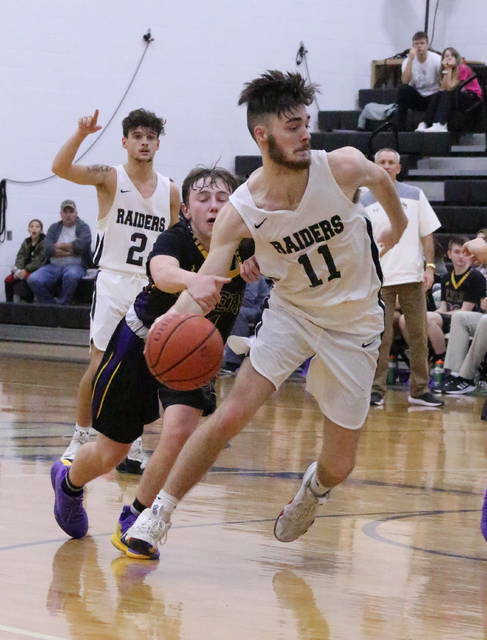 The Raiders ended the final 4:01 of play with an 11-3 surge that included an 8-of-12 effort from the charity stripe, allowing the hosts to pick up their first victory over an Ohio-based program this winter. 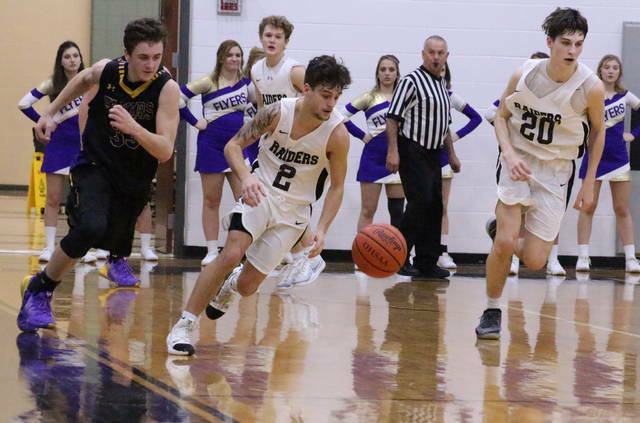 After having months of hard work and effort usually result in a setback, RVHS coach Brett Bostic was pleased with the way his troops once again battled over four quarters of play. The difference in this one, besides the final result, was the effort that his players gave from start to finish … and that was something that brought one big smile to Bostic afterwards. “We’ve talked about putting together 32 minutes all season, about starting well and finishing strong. I thought we did all of the little things right for the better part of four quarters tonight, and that’s why we were able to get out of here with a win,” Bostic said. “It was about a complete of win as we’ve had this season, mainly because everybody contributed in so many ways. We played really good defense, we rebounded well and we were unselfish in our play. And we made some shots. The Raiders outrebounded the guests by a 37-25 overall margin, including a 9-5 edge on the offensive glass. The Silver and Black also committed five of their dozen turnovers in the fourth quarter, while ISJHS finished the evening with 11 miscues. River Valley made 19-of-48 field goal attempts for 40 percent, including a 4-of-20 effort from behind the arc for 20 percent. RVHS also went 13-of-20 at the free throw line for 65 percent. Jordan Lambert paced the hosts with a double-double effort of 22 points and 12 rebounds, followed by Brandon Call with a double-double performance of 11 points and 11 caroms. Layne Fitch Rory Twyman were next with eight points apiece, while Myles Morrison and Chase Caldwell completed the winning tally with three markers each. Caldwell also hauled in 10 boards for the victors. The Flyers netted 16-of-51 shot attempts for 31 percent, including a 6-of-25 effort from 3-point territory for 24 percent. The guests were also 8-of-11 at the charity stripe for 73 percent. Zach Roach led ISJHS with a game-high 26 points, followed by Damron with eight points. Sheridan and Issac Whaley were next with five points each, while Jimmy Mahlmeister completed the tally with two markers. Damron hauled in a team-best eight rebounds, with Roach and Sheridan both grabbing five caroms apiece. River Valley returns to action Friday when it travels to Nelsonville for a TVC Ohio matchup against Nelsonville-York at 6 p.m.